Ha, I love North Boulevard but that bridge never fails to piss me off. I don’t mind the climb, it’s just that I always seem to catch the lights at the bottom and you can’t see if there’s cross-traffic til you’re practically at the interesection so you end up using the energy from the climb to heat up your brake pads. Bikely seems to shows the natural terrain on it’s elevation profile for North Blvd because it’s dropping to 0 m over the river, I wonder how tall that bridge really is. If you want a good hill Mango Rd out in Thonotassa has one that I’ve hit low 40s coming down and if I was gutsy enough to push harder I could probably hit 50 but low 40s is fast enough for me. It’s only 10 meters of elevation change over half a km but it’s steep enough to make this flatlander curse and gear down going up. 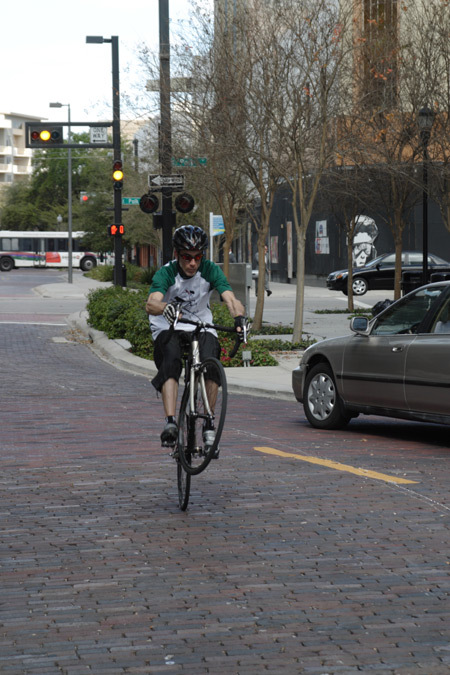 I’ll have to check out the Mango Road hill…like you, I HATE the stoplights on the North Blvd. bridge ends — can’t safely get up a good head of steam without getting a red at the bottom. It’s a sharp bike. The fork/fender issue perplexes me. It’s not like Dynamic is actually building anything. They have the bike built in Taiwan. And they spec a fork out of a catalog. So why not spec one with clearance for a fender? I know carbon fork with fender clearance exist. I’ve seen them. Heck, I’ve seen them in the Nashbar catalog. 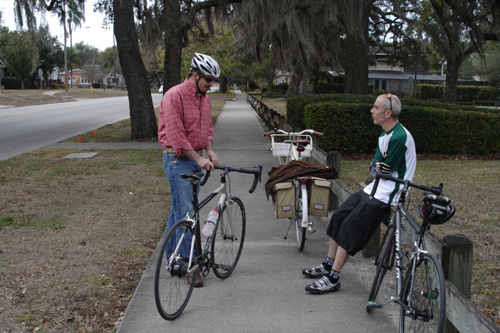 Do you think that the bike will be too heavy for the gearing once a rack and loaded panniers are added? Maybe not for us flatlanders but will adding an additional 10-15 pounds to the rear make hill people long for a wider gear range? I think a lightish load on the back (20 lbs. or less) would be fine for anyone other than the mountain-dwellers out there. 40 gear inches isn’t quite as small as I’d like for loads, but not too bad. As for the fork issue, perhaps this is another pre-production oversight? Of course, the bike isn’t geared toward the fender crowd — sure, the rear rack mounts suggest a concession toward versatility, but let’s face it: this bike is for folks who want to go fast without a lot of complexity. Pingback: Pages tagged "the road"
Hey, Jack, that’s a wimpy bridge. 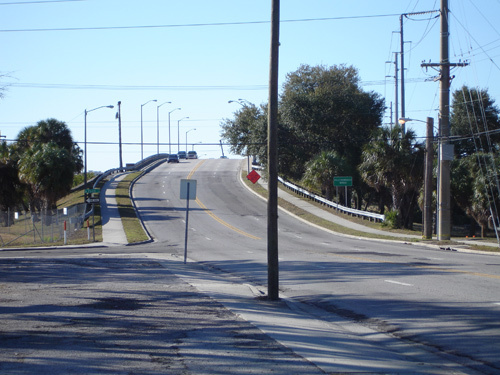 Come over to the other side of the state to Riviera Beach and climb what passes as a mountain for us: the Blue Heron Bridge. There’s not a bike out there like this, if it had clearance for fenders, and disc brakes (or at least tabs) they could definately capitalize on this bike as a commuter bike. The depth of the drop outs doesn’t seem to leave much room for any chain stretch as the anti-rotational washer (I think that’s what it’s called) is almost at the end of it. I think the production version fork ends will have a slightly longer axle slot. If you’re willing to push one of the higher gears, the Alfine will let you go just as fast as you want! Total bike weight of 21 lbs. is nothing terrible to sneeze at, either. No. I have an IRO Rob Roy built up into a commuter with a Nexus 8 hub and the same gearing, 46-19. With rack, lighting, and fenders, it weighs in just under 30lbs. Commuting with up to 20lbs in the rear panniers has not been too difficult–there’s one hill where I was in the low gear once thinking I might need a smaller chainring, but after H-ingTFU and commuting for a while, it’s not an issue. My commute is 35mi r/t, about half of it moderately hilly. 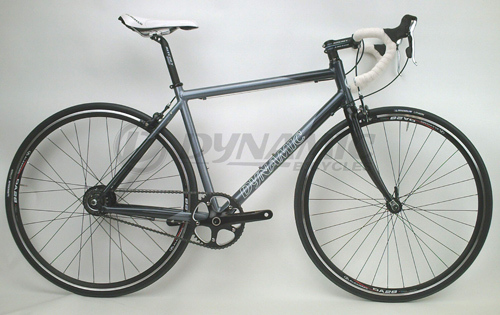 Dynamic should leave this as a road bike, skinny fork and all, and introduce a true commuter soon. 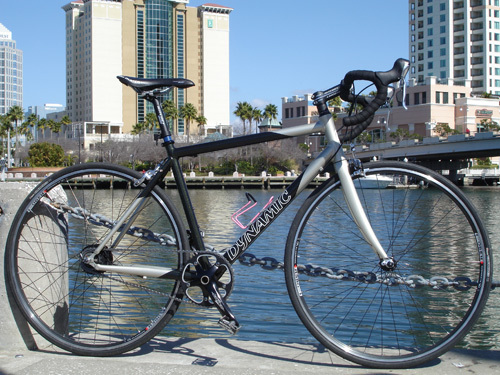 The commuter should take wide tires, fenders, racks, and hopefully have forward-facing horizontal dropouts–rear-facing track dropouts + fenders can lead to tire change issues. And that’s on top of the fact that some think the Shimano cable/hub interface is not the best for emergency tube changes… Also, track ends are not as friendly for brake adjustment. Sad to say, but I think they’re barking up the wrong tree, trying to sell this as a performance road bike–a performance-oriented commuter would be fantastic, but this falls short in too many critical ways. Mike C—-it should have a steel frame, too. LOL!! The lack of tire/fender clearance is the worst feature of this bike. 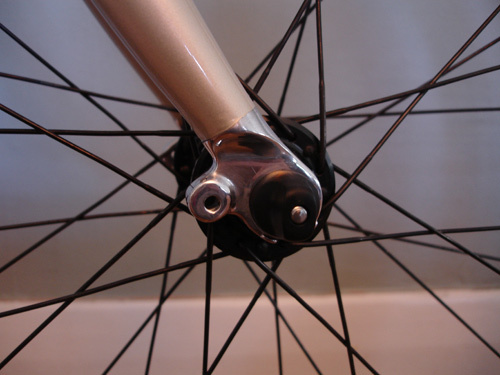 Once you put on a ~3 lb rear hub on a bike, what is the harm in a little bit of extra stay length and fork clearance? As much as it pains me to say it, dynamic should offer this exact same bike with 650B (ISO 584) wheels and appropriate brakes. That would give clearance for a decent size tire and fenders, with a minimum of manufacturing differences. Hey, now, I got nothing against aluminum. In fact, the way they are selling this–as a performance road bike with an IGH–is fine with me. Just that they should come out with a different commuter model as well. Dynamic is just trying to broaden their market…and that’s a good thing. Just like the shaft-drive, Dynamic is obsessed with coming up with different drivetrain options that fall outside convention. Besides, they’re the first to figure out an STI-style shifter for the IGH, which opens up all manner of fragrant possibilities and new models: light touring, commuter-specific, etc. I can’t speak for Dynamic, but I wouldn’t be surprised to see other models offered with this setup in the future. And for those who question a 3 lb. hub on a “performance-oriented” bike, let’s break it down: Let’s say you’ve got a Shimano Ultegra-equipped bike — rear derailleur, 9/10 cog cassette and hub weigh somewhere in the neighborhood of 800 g. Add in a front deraileur, an extra chainring, longer chain and the attendant cables and housing and you’re somewhere over 1000 g. Compare THAT to the Alfine, which weighs around 1500 g. Yes, the Alfine weighs more overall, but only about a pound. I can live with that if it means seamless shifting and reduced complexity in my drivetrain! I’m confused. Doesn’t Dynamic already make several commuter bikes? After looking at them I’d hazard that at least one or two are more aggressively lined and might be termed “fast commuter bikes.” Of course those are shaft driven bikes so people might be dismissing them from this discussion. From my point of view, any tech that makes shifting less of a chore is an improvement! @Mark Muller: +1 on the 650B wheel on the same frame idea. Simple for them, and likely to be popular enough to be worthwhile. Probably more popular than this bike, but you never know. A lot depends on where they get their parts of course seeing as 650B rims as well as those Alfine hubs still aren’t super common. I’m not seeing any other drop bar Dynamic bikes, I think that is what’s making it more “performance ” oriented. Guys, this is NOT advertised as a “commuter” or “fast commuter” or anything else other than a fun, speedy, simple bike for enthusiasts. Yes, it will accept a rack on the back and yes, it can be pressed into service as a capable commuter bike, but none of that was Dynamic’s intention in developing this machine. Addition of rack points is merely a concession towards some versatility. The reason it is considered a “performance” bike is that it has drop bars, a far more aggressive riding position (modern road bike geometry) and is WAY lighter than any other Dynamic offering. 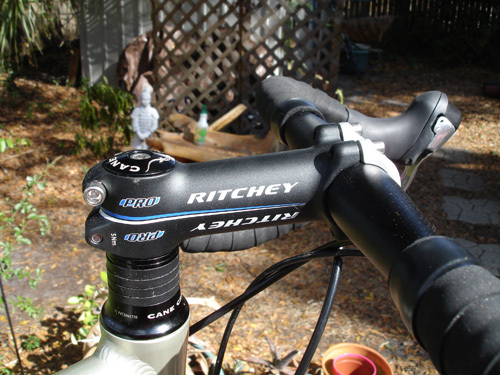 Let’s see how this new shifter/hub combo does…if it’s popular, I am sure that Dynamic and other manufacturers will make more tailored machines (for light touring, commuting, etc.). Your tag does say “commuter bikes”. I am only so verbal because I like it a lot, and they are so close to something unique enough to stand out. I just wanted to make it clear that Dynamic doesn’t advertise this as a commuter bike — of course, ANY bike is a suitable commuter in my book, as long as it gets you where you’re going without falling apart! The fender mounts are on the front dropouts because we are working on a specially designed fender for this bike. We expect to have these soon, so the mounts provide a great option for people to add some stylish fenders for all-weather versatility. The weight and performance of this bike are impressive because of how much better it is than other IGH bikes. IGH may have some efficiency disadvantage over a perfectly maintained chain setup, but I know few commuters that can claim their externally geared bikes are always perfectly maintained, especially those ambitious riders in northern parts of the US through some pretty ugly winters. As far as gear range, the design of this bike makes it super easy to swap out the rear cog to manipulate the gearing range to your style and terrain. We recommend anywhere from 18-21T cogs in the back. This gives a tremendous range of versatility. Also, the dropout on the test frame Jack rode was changed for final production. The production frame rear dropouts were extended and mounting holes for fender/carrier were added. As far as a ‘true commuter model’, we are right there with you on this. We have additional bikes in the works, including a steel frame, dual disc model for release this summer that will be a truly dedicated commuter. A bit heavier than the Synergy, but dialed in for commuters. The Synergy model that Jack is riding was the first model we released because we believe the performance capabilities of the IGH go far beyond the ho-hum retro comfort-city IGH bikes that everyone else churns out. The Synergy is styled as an event/club/fitness road bike, but the reason we sent it to Jack first for review was because we know it will be awesome for medium-long commutes. I know I’ll be commuting on it. But suffice to say keep your ideas coming. We’re anxious to bring to market unique bikes for commuters that are fun to ride, simpler to operate and simpler to maintain. 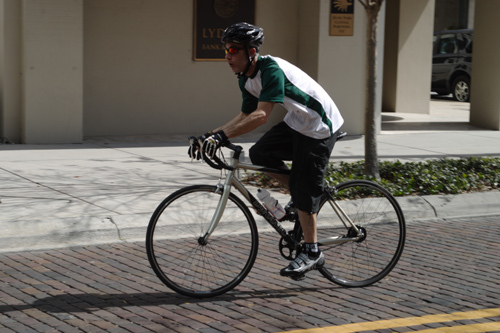 Patrick Perugini – President, Dynamic Bicycles, Inc.
That’s what I like to hear! Now I just need to know how much. I am INTENSELY excited about a dual-disc commuter model…coupled with the IGH and shifter, that’s gonna be pretty darn badass!!! So let me get this straight—instead of using an already available carbon cyclocross fork which will allow fender mounting—Dynamic is going to spend R&D money designing a new fender? Pardon me, but WTF? However, the upcoming steel-framed dual disc model sounds boss. It’s funny that when I emailed Patrick and suggested a steel frame he replied that they were “staying with aluminum frames”. Hmm. I only hope they go with a nice steel. How about Reynolds 853?? Patrick, if you’re reading this, do your research and get things right. That means room for fenders, mounts for racks, and putting the rear disc mount on the chainstay to facilitate easier rack mounting. You pay attention to the details and you may create the perfect commuter bike(loaded though that term may be LOL). Mike – we are sticking with the aluminum frame on the Synergy model. Our aim with the Synergy model is keep weight at a minimum, and really show off the performance potential for an IGH bike. The commuter model we’re working on will be a nice Cromoly frame and fork because on this model we are willing to give up a bit of weight to get the ride quality and durability of the steel. Different strokes for different folks. In the meantime, the fender mounts on the Synergy fork are going to stay as we are working on the fender set for this. Cyclocross forks were not the look we wanted on this model, which is why we didn’t go this route. We wanted a road specific look for the Synergy. Hello folks, I am happy to have discovered your bikes, and the ensuing controversy. I live in California and we have lots of hills and I tend to travel a fair amount. I need a bike for daily fast and efficient commuting and going off roads whenever the call arises, so I need a fast and strong commute mountain bike. I carry large and heavy packs freaquently, due to lots of different activities I do, work related, school, shopping, picking up materials from the lumberyard, etc, etc. I like a good strong packmule of a bike that is also fast, and can handle the most extreme range of gears from being able to climb some of the most steep hills to being to fly down hills faster than most bikes will let me due to running out of chainring power and having to slackpedal. I hope you know what I mean. I’ve several times tried to upgrade to both higher and lower gear ranges and repeatedly was told at shops that they just could not do what I wished to accomplish. 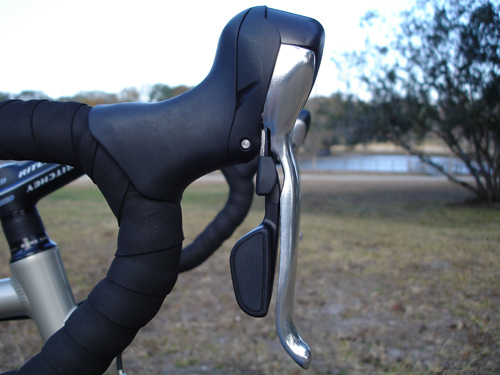 I also wish bike manufacturers would create a 4 speed front shifter/derailleur for that wider range I yearn for. Many kudos to you for providing what I wished for for years — the shaft drive! Alrighty then, what can you folks tell me about satisfying my wishlist? Thanks, Joe. What would be your preferred high and low gears (in gear inches)? That would help answer your questions better. As for getting a shaft drive bike to have that much range, you’re probably out of luck. With most such bikes, range goes from about 35 gear inches up into the low 100s (110 or so? )…all this depends on what size cog and chainring is on the bike. You’ll have to shift it in friction mode, though. I hope for the steel commuter model mentioned, they’ll consider putting on a full chainguard (aka chaincase – a piece that completely encloses the chain). One of the big advantages to an internal gear hub is the ability to completely protect the chain from the elements, but most manufacturers seem to miss it. The only commute-worthy bike I know of with a full chaincase is the Breezer Uptown. A full chaincase would make a difference for rain, but it would make a HUGE difference in being able to keep all that road gunk off the chain in the winter with all the salt, sand, and snow on the road (like here in Minnesota). If people would complain it wouldn’t look good enough, make it optional. It would be a huge draw for me. I’d love to have one – come to think of it my problem is that there’s no bike that has an Alfine hub AND a full chaincase (the Breezer has a Nexus, and the version they sell with an Alfine has no chaincase). @Mike C- my own commuter has full fenders (SKS Chromoplastics) and track ends. I was concerned myself before I put them on that there would be issues getting the rear wheel out but in practice it is not a problem. Hill? my driveway is longer and a better climb. Why not do a review of real riders in real conditions. 21 LBS is heavy in a carbon world. My road bike is 17 pounds so climbing would be 4 pounds less per peddle. That adds up over 40 to 60 miles a day. Sorry it is a commute bike not a real road bike. And we’re all SO impressed by your light bike. Do you want a cookie or a medal? I thought you’re not supposed to pedal and shift at the same time on internal hubs. Does that work OK for this one? 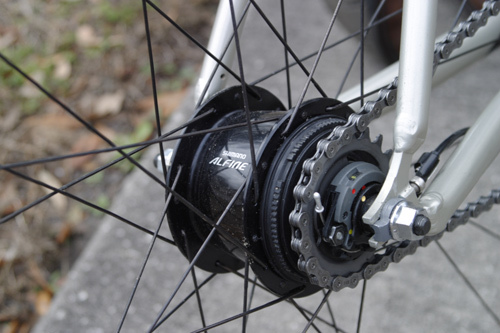 The best practice for any shifting system is to let off the pressure just prior to shifting, but the Alfine hub can handle shifting under load. Probably not the best thing to do all the time, but perfectly fine for occasional needs. I’ve spent the last two days scouring the internet for information, reviews, press, and discussions for the Dynamic Synergy bike. I was surprised to discover that in order to test drive the Synergy, I would have to dive in and and buy one! Although internet-only shopping for bikes may be a common practice these days, it’s been years since I’ve purchased a new bike, and I would really like to test ride it before committing $1000+. There is lots of pre-release buzz online about the Synergy, but I can’t find a single post from someone who owns and uses this bike for daily riding. Based on it’s specs, this bike appeals to me a great deal, but I would really like to hear from some folks who ride it, or something very similar (IGH, drop bars, aluminum frame), before making the purchase. Is there anyone out there who is riding this bike? If there’s already a site/forum out there where this bike, or something similar, has been discussed at length a link in the right direction would be very helpful!